My interest in glass began as a youth in church. While I was supposed to be praying or listening to the sermon, I couldn't help but look at all the stained glass windows. I observed windows filled with figures of Jesus to the left of me, Mary to the right of me, enthroned and attended by twelve angels, and windows of Saint Peter and Saint Catherine required my stare. Over the course of the next twelve years, I memorized every face, garment, landscape, color, celestial figures and all those halos. I came to realize "God must have placed me in the midst of all this beauty for one reason, and one reason only, and that was to observe these beautiful stained glass windows." The beauty and artistry of stained glass intrigued me, but I wondered how it was made, how it was put together, and how could these tiny pieces of glass be suspended in mid-air? The answer came to me somewhere in the mid-70's when I was involved with the remodeling of an old federal courthouse building in downtown St. Paul, now known as the Landmark Center. While there, I observed a stained glass barreled ceiling being repaired and I asked the craftsman questions like, "How did you learn your trade? ", "How did you get interested?" 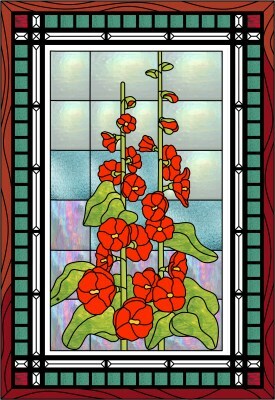 After that conversation, I decided then and there that I would pursue stained glass in the future. I attended classes at the University of Minnesota to study landscape design and landscape rendering, and also took numerous classes at local colleges that included painting, sculpting and pencil sketching. 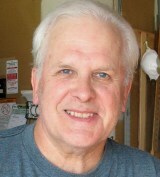 I also took courses through local stained glass distributors in the Twin Cities area. The inspiration for this Hollyhock design goes all the way back to my childhood memory of a neighbor woman who had the most fantastic hollyhocks in her garden. I wished to honor her memory in creating this piece for submittal to the Minnesota State Fair. It was awarded a first-place blue ribbon. As a general design criteria, I prefer to use a grid pattern in the background because to my eye it works better. I don't particularly care for glass splice lines arbitrarily going off to the edge of the design, frankly, because I'm not very good at it, therefore, the design does not flow well for me. The Rotate and Stretch commands in Glass Eye 2000 were very helpful because they allowed me to illustrate the various stages of the hollyhock bloom around its central stalk. In Color Mode, Glass Eye 2000 allows me to select the hue, value and intensity of colors. The inventory of glass provided in Glass Eye 2000 helped me to select my preferred glass, and also to help me select a complementary color for the stain used on the wooden frame. I feel that the stain used on a wooden frame is equally as important as the choice of glass for creating a complete color harmony. As a retired structural steel estimator, I have found that using Glass Eye 2000 materials properties spreadsheets are very useful in determining realistic cost figures for my projects. I recently upgraded to the Professional Plus Edition and wished I had done so sooner because when I'm doing commissioned work that must fit into an existing opening, the program allows me to enter exact existing opening dimensions required for my design without using gridlines. I am currently using Glass Eye 2000 to do the central design of my mosaics. In conclusion: How can I dispute the beauty of glass when it is even referenced in the New Testament: Revelation 4:6, "...there was also what looked like a transparent glass sea as if of crystal..."
Dennis is a retired structural steel draftsman and structural steel estimator. At one time he also maintained his own "wheelbarrow and shovel" landscaping business which he worked during Minnesota's very short summers. His interest in flowers, in particular, and having grown many plants from seed, gave Dennis a thorough understanding of the culture of flowers. 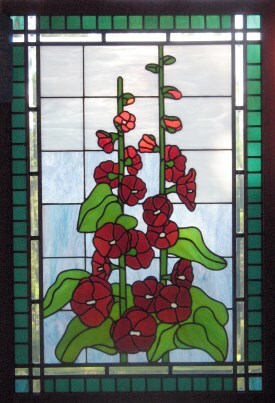 That knowledge has led him to use repeated themes of flowers in his many stained glass designs. You may reach Dennis by email.